IEC 60825-12:2019 is available as IEC 60825-12:2019 RLV which contains the International Standard and its Redline version, showing all changes of the technical content compared to the previous edition.IEC 60825-12:2019 provides requirements and specific guidance for the manufacture and safe use of laser products and systems used for point-to-point or point-to-multipoint free space optical data transmission in the wavelength range from 180 nm to 1 mm. This document only addresses the open beam portion of the system. If portions of the equipment or system incorporate optical fibre that extends from the confinements of the enclosure(s), the manufacturing and safety requirements in IEC 60825-2 apply to those portions only. This document does not apply to systems designed for the purposes of transmitting optical power for applications such as material processing or medical treatment. This document also does not apply to the use of systems in explosive atmospheres (see IEC 60079-0). Light-emitting diodes (LEDs) employed by free space optical communication systems (FSOCSs), used for the purpose of free space optical data transmission, do not fall into the scope of this document. This document covers lasers employed by FSOCSs used for the purpose of free space optical data transmission. This document: • provides information to protect people from potentially hazardous optical radiation produced by FSOCSs by specifying engineering controls and requirements, administrative controls and work practices according to the degree of the hazard; and • specifies requirements for manufacturing, installation, service and operating organizations in order to establish procedures and provide written information so that proper precautions can be adopted. Because of the nature of FSOCSs, also known as optical wireless or free-air information transmission systems, care is taken in their manufacture as well as their installation, operation, maintenance and service to assure the safe deployment and use of these systems. 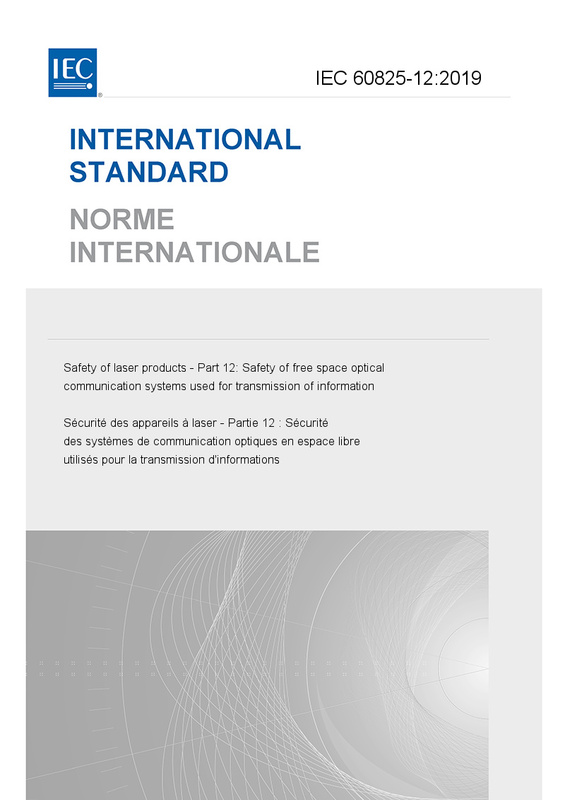 This document places the responsibility for certain product safety requirements, as well as requirements for providing appropriate information on how to use these systems safely, on the manufacturer of the system and/or transmitters. It places the responsibility for the safe deployment and use of these systems on the installer and/or operating organization. It places the responsibility for adherence to safety instructions during installation and service operations on the installation and service organizations as appropriate, and during operation and maintenance functions on the operating organization. It is recognized that the user of this document may fall into one or more of the categories of manufacturer, installer, service organization and/or operating organization as mentioned above. This document does not apply to a laser product if classification by the manufacturer according to IEC 60825-1 shows that the emission level does not exceed the accessible emission limit (AEL) of Class 1 under all conditions of operation, maintenance, service and reasonably foreseeable failure. Key words: Laser products, Free space optical data, Free space optical communication.